Cancer remains the second leading cause of death, after cardiovascular diseases, in industrialized countries. The first goal to achieveis to prevent cancer occurrence or to diagnose it at an early and curable stage. Some screening strategies have been developed, with controversies across countries, for several cancer type; colorectal, breasts or prostate cancer for example. Treatment of cancer is generally based on surgery and radiotherapy for localized and attainable tumors, associated, in some cases, with adjuvant chemotherapy. Chemotherapy can also be used as first line treatment for disseminated diseases. 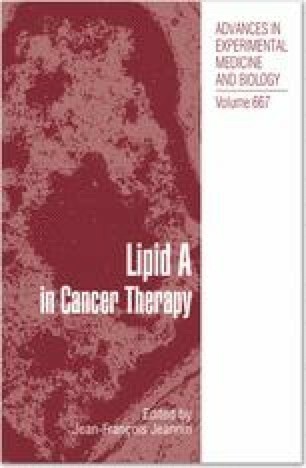 LPS and their active component lipid A, have been used in tumor therapy since the 19th century. Studies in animal models have shown promising results on different models of cancer but data from human trial are scarce. The published Phase-1 cancer studies have shown that lipid A analogues are usually well tolerated, most of the side effects being likely related to immune response, i. e., fever, chills and rigor. The administration of several lipids A analogues was shown to result in a significant increase in circulatinglevels of several cytokines but no objective antitumor responses were observed. Therefore clinical activity of such molecules deserves further experiments, likely in conjunction with chemotherapy.